Though Irma should be well past us Tuesday morning, the likelihood of power outages and roads blocked because of fallen trees is very high, and very possibly worse for some families than others. 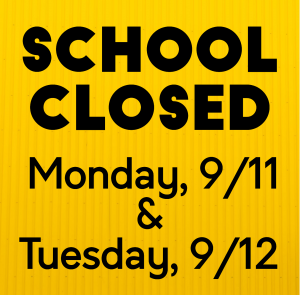 Therefore we will also be closed Tuesday, 9/12, as well as Monday. We hope and pray everyone stays safe and for those directly affected in Florida, Georgia, and anywhere else.